It’s one thing knowing when to go all-in in poker. It’s a whole separate topic when discussing when not to go all-in however. I wrote this article is for players new to the game and those who move all-in too often and at the wrong situations. A number of players new to the game consider going all-in as the ultimate pure bluff. They think shoving their chips into the middle will represent the strongest of hands, and even opponents with mediocre hands such as 2nd pair will fold. The problem with this view, is more times than not the all-in bet will dictate a sign of weakness. Much like a leopard stalking an injured deer; good players can sense when an all-in bet is a sign of weakness or bluff – and they’ll be under no hesitation to call. In my experience I’ve seen this happen time and time again in both live and online poker games. It’s where the majority of sharks and consistent players earn their money; and it tends to leave poor poker players aghast posting on forums that online poker is rigged. If you’re opponent’s weak, or you suspect his hand isn’t the best, there’s no need to go all-in. 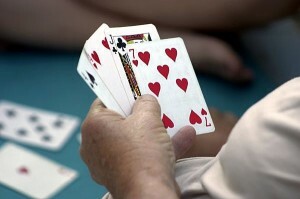 In fact, a smaller pot-sized bet – or even the famous oak tree bluff (where you bet a tiny amount on the river to make it look as though you want your opponent to call) could cause your opponent to fold. Considering this why would you bother risking your entire stack when you could end up risking only 20% of this with the same result? In a $1/$2 cash game with only one opponent on a dry board with a pot worth $10, it will realistically only take a half-pot bet of $5 to take it down against a weak opponent. In addition to this like I suggested above, going all-in rather than pot-betting can seem a weaker and more peculiar bet. Many poker players in online games hit the all-in button when there’s limited action on the table. The problem with this is that loose players with monster hands can easily trap you. Their topsy turny table image and mash of cards makes it incredibly hard to put them on a range or even read their checks. Another problem is that placing all-in bets out of position can run you into trouble. Remember, going all-in as a bluff should rake into account your equity in the pot and the fold equity of others. Without enough information on your opponents, there’s every chance you’ll get called on your bluff and bust your chips to the player next to you with a straight. If you’re going all-in as a means to steal the pot, make sure your current chip stack and all-in bet is large enough to discourage callers. Your bet needs to be at least half the size of the pot and you can’t really do this against deep stacks (+100BBs chipstack). A small chip stack doesn’t carry the fold equity or intimidation needed either, and your shove will look weaker when you’re already pot-comitted. Play at a Safe and Secure Poker Room! Are you tired of being scammed by a poker room? Join Party Poker, the safe and secure poker site. New players get a 500$ bonus - join now! When to Go All-in in Poker?